He seems like the type that would play on "beginner" just to score 100 in a match. 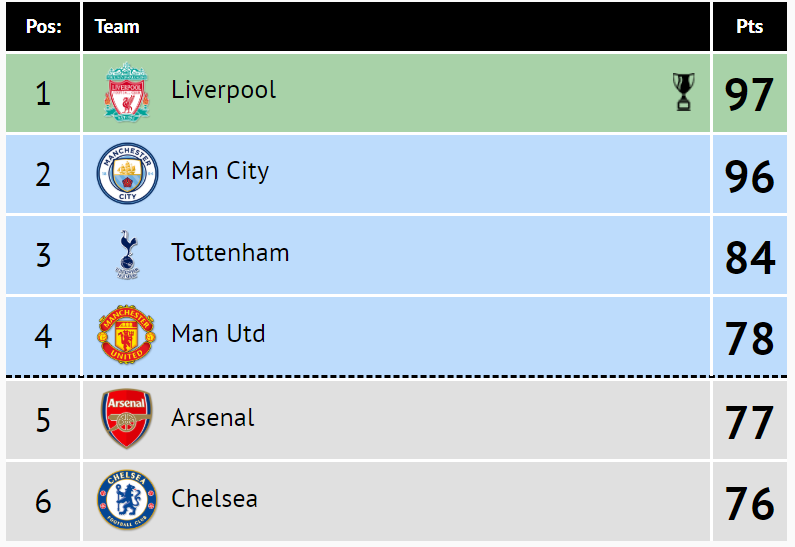 The way City are dominating, Liverpool are looking shaky and Tottenham keep finding ways to grind out wins. The title might actually be a 3 team race to the final month. 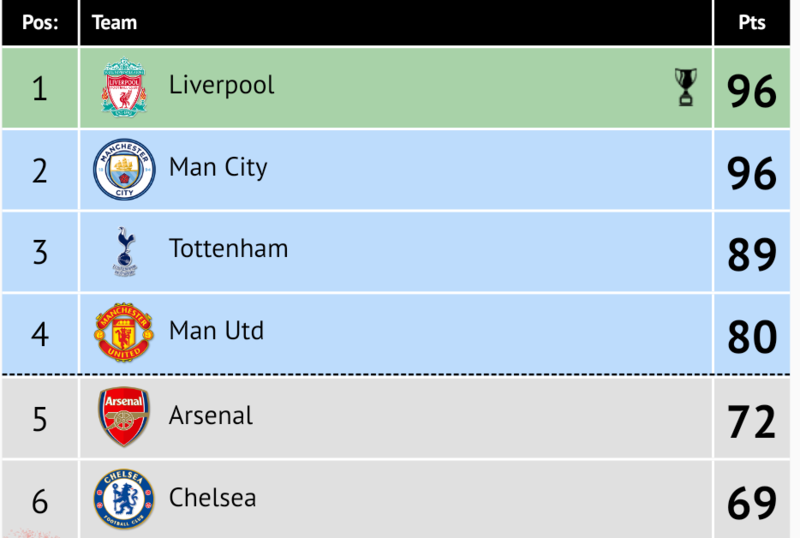 I think Chelsea will fall from the top 4 race. After this defeat they will have more questions than answers and this group of players does not look like the type to fight through adversity. United/Arsenal will fight for 4th. Mourinho to Chelsea next season? Yeah I honestly think it’s going to come down to the United game for us, and we haven’t won at old trafford in like 5-6 years. Holy sh.t - Man City are flying against Chelsea.... Can you do better @DB1512 in your CM? That is what gives Liverpool that advantage right now. 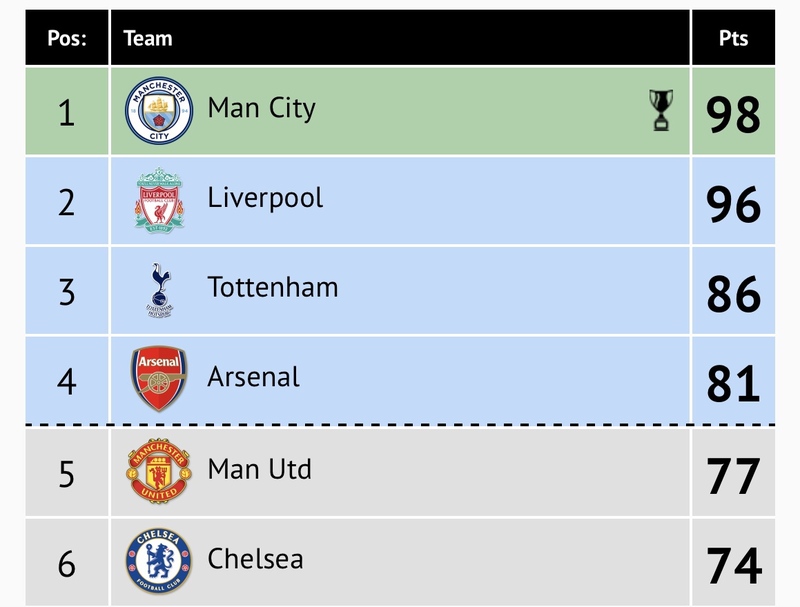 City are still in 4 competitions with Liverpool only in 2. Ok honest question here.... let’s say Liverpool win the league but crash out against Bayern while City go on to win the CL, League Cup and FA CUP. Still a good season for both teams? That is a tough question. It obviously comes down to the individual if they are happy. As a neutral, I would say City are far supior and had a better season than Liverpool if the titles ended like that. Liverpool dropping out of 2 cups very early shows me they do not have great depth. But the starting XI is top class no question. Liverpool fans would be ecstatic with the title alone. Other fans would probably say Liverpool didn't live all the way up to their potential. After a slight change to the recent rule changes regularising OT/RF, you can now discuss RF in this thread as much as you like. This will be the thread for the section. For those poor on abbreviations? Other Things / Real Football? Off Topic (non-FIFA/Football e.g. other sports, other games, TV etc) and Real Football. The change is basically one real football thread per section. @Ashy what’s the website to do that on? I’ll have a go. It’s going to be a fun finish to the season. I think Man City will drop points at least one more time this season, probably a draw somewhere. 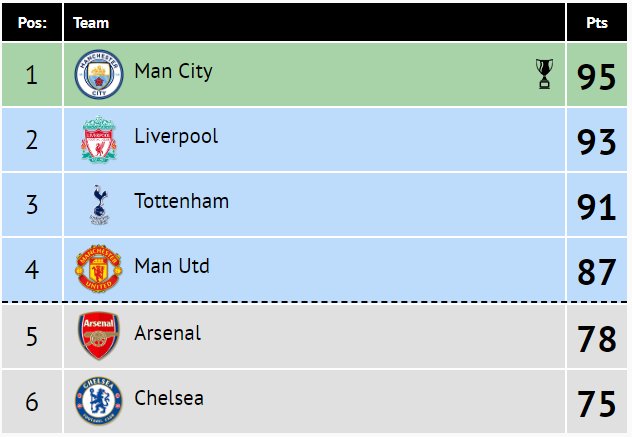 Spurs and ManU will likely define the outcome of this title race as both city and Liverpool have to play them still. If we beat United I think we carry on and win it. Lose or draw again and I think we’ll just miss out. I had the deciding match as Newcastle beating Liverpool. If Newcastle need a win to stay up on the penultimate weekend of the season then I can't see them losing at St James' Park. @Alastair I like your table better. Makes it seem like all 3 teams are close at the end. While I think ManU will beat Liverpool in a few weeks, there remaining schedule is pretty brutal compared to Arsenal. I just think Arsenal will somehow pip them to 4th even though I think ManU is the stronger team. Who can you see them losing to? City is the only one I was even slightly unsure of. My thinking is that Arsenal go deep in UEL and start losing some league games as they try getting into the UCL by winning a pretty weak Europa this season.